It is the quick and effective way to nourish established plants in pots or in your garden! Liquid fertilizers will have an effect almost immediately, assuring continued, superlative growth and quick recovery for crops that are tired and undernourished. 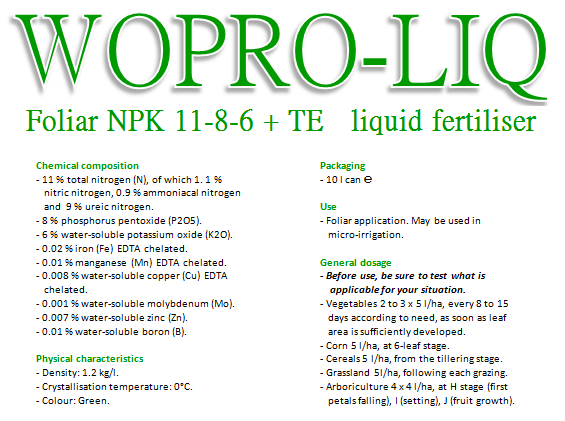 We can offer you a variety of WOPROFERT® liquid fertilizers. A specific Magnesium and Sulphur application. Our liquid fertilizer improves flowering and ripening, accentuates early development and increases the size and quality of fruit. Read the recommendations for use to have the best results for your plants. Our liquid fertilizer is compatible with the majority of agrochemical products. However, in order to obtain better assimilation, it is preferable to use separately. With a foliar spray, apply 200 to 300 ml per 100 liters of water. Do not treat in very hot weather or in very bright light. In critical phases of growth and/or in adverse development conditions, 2 to 4 treatments are recommended per crop. All components are metallic form. Our liquid fertilizer provides a complete mixture of the micro nutrients, called micro elements. Very essential to the plant vitality and the correct functioning of its metabolism. It can correct the most common manifestations of micro element deficiencies: chlorosis, floral abortion, withering, malformations and falling fruit, etc. The foliar treatments are more desirable being both more economical and faster to correct the deficiency for the curative treatments. With an obvious symptomology of micro-deficiencies, it is necessary to redouble the dosage and the frequencies of the treatment.